(INDIANAPOLIS, IN)--Former Mount Union and Cleveland State volleyball player Sarah Parker (Geneva/Geneva) has been awarded an NCAA Postgraduate Scholarship. Parker is one of 29 female Fall Sports/Student-athletes in the entire nation to earn a $7500 scholarship. After spending two years at Cleveland State, Parker transferred to Mount Union where she played in 98 matches over three seasons and was a three-time All-Ohio Athletic Conference selection, two-time All-Great Lakes Region and this past season was only the third player in school history to be named an All-American. She helped lead the Purple Raiders to a school-record 30 wins in 2007 while in 2009 Mount Union made its first-ever appearance and earned its first-ever win in the NCAA Division III Women's Volleyball Championship. Off the court, she was a two-time Academic All-OAC and Academic All-District selection who in 2009 was Mount Union's OAC Clyde Lamb Award winner given annually to the top female scholar athlete. Parker completed her studies this past December with a 3.93 grade point average and earned a degree in business administration. She is currently pursuing a master's degree inhealth systems administration at Cleveland State. (WHEELING, WV)--Mount Union's men's track and field team won six events and placed second at the Bill Horne/Wheeling Jesuit Track Invite in Wheeling, West Virginia. The Purple Raiders scored 141.5 points which left them just 2.5 points behind Malone that won the 14 team event with 144 points. Senior Judd Lutz (Tiffin/Tiffin Columbian) and sophomore Sean Denard (Naperville, IL/Naperville North) went 1-2 in the the discus with marks of 170-10.68 and 160-9.12 respectively to both qualify for the NCAA Division III Track and Field Championships. Lutz also won shot put and provisionally qualified for the national meet with a mark of 52-8.64. Junior Ty Griffin (Massillon/Massillon Perry) also won a pair of events as he claimed titles in the 800 (1:56.87) and 1500 meters (3:57.03), while the other wins came from junior Marc Aukerman (Greensburg, PA/Latrobe) in the javelin (176-5.28) and senior Scott Thomas (Salem/West Branch) in the 100 meters (11.24). Other top performances included second place finishes from sophomore Tim Kelly (Lakewood/Lakewood) in the 800 (1:57.13), freshman Jesus Garza (Round Rock, TX/Stoney Point) in the shot put (49-3.72), junior Erik Reed (East Liverpool/East Liverpool) in the 3,000 meter steeplechase (10:09.74) and Charles Pratt (Canton/GlenOak) in the 100 meters (11.24). Judd Lutz had the second-best discus throw in the nation so far this season at the Bill Horne Invite. Mount Union will compete Saturday, April 3 at the OAC Gold Meet in Marietta. (AUSTINTOWN, OH)--Mount Union senior Travis Papay (Chagrin Falls/Kenston) was named Ohio Athletic Conference Men's Tennis Player of the Week today. Papay scored the Raiders only point at No. 4 singles in an 8-1 loss to nationally ranked Denison, then came back and scored wins at No. 4 singles and at No. 3 doubles with partner Zach Perry (Hudson/Hudson) at No. 3 doubles in a 9-0 win in the OAC opener against Heidelberg. On the season, Papay is 7-1 overall in singles play for a Mount Union team that is 7-1 on the season and 1-0 in the OAC. Mount Union hosts Ohio Wesleyan Wednesday, Mar. 31 at 4 pm in Alliance. (ALLIANCE)—To take words from a Jack Kerouac novel, Mount Union will be on the road again, again and again to start the football season as a total of six road contests highlight the 2010 schedule released today. The Purple Raiders head north and west to start the season Saturday, Sept. 11 at The University of Wisconsin-Oshkosh in a game that will kick off at 2 pm eastern (1 pm central) from Oshkosh, Wisconsin. Mount Union will start the Ohio Athletic Conference portion of its schedule seven days later (Sept. 18) at John Carroll then stay on the road the following week (Sept. 25) heading to Wilmington. After covering 1,690 miles round trip, the Raiders host rival Ohio Northern in the home opener which will also be Family Day on Saturday, Oct. 2 at 1:30 pm. It is back on the road the following week (Oct. 9) with a 1:30 pm contest at Marietta, before back-to-back home games the next two weeks (Oct. 16 and 23) with Heidelberg and Capital. Both of those home games kick off at 1:30 pm with homecoming being the Oct. 23 matchup with the Crusaders. Road contests at Otterbein (Oct. 30, 1:30 pm) and at Baldwin-Wallace (Nov. 6, 1:30 pm) take the next two weeks before the regular season finale and M Club Hall of Fame Day against Muskingum on Saturday, Nov. 13 at 1:30 pm at Mount Union Stadium. Season and single-game ticket information will be released later in the spring and every home game is slated to be broadcast on television on WIVM/WIVN TV (Canton/New Philadelphia) and cable sports network SportsTime Ohio. The Purple Raiders enter the 2010 season winners of 18 consecutive OAC championships dating back to 1992. Mount Union has played in each of the last five Amos Alonzo Stagg Bowls (NCAA Division III National title game) and the Raiders have a record 10 NCAA Division III National Championships. This coming season also marks Larry Kehres' 25th as head coach at Mount Union and he enters the campaign with a 289-22-3 (.925) record. WESTLAKE -- Men’s Tennis – Shaker Heights native Jeremy Polster, the second singles player for Kenyon, has been named the NCAC Men’s Tennis Player of the Week, the league office here announced today. Kenyon junior Jeremy Polster (Shaker Hts., OH/Shaker Hts.) posted victories at second singles and third doubles. He led the Lords to a win over 29th-ranked Bates, 5-4. Wooster senior Elissa Lauber (Dover, OH/Dover) posted three victories as she went 2-0 at No. 1 singles and picked up a win at No. 1 doubles against Heidelberg. The two victories in singles play were her first two wins of the season. The Fighting Scots topped The Berg, 8-1, and fell to Wittenberg, 8-1. DENISON went 3-1 last week as they posted victories over Ohio Wesleyan, 9-0, Mount Union, 8-1, and Earlham, 9-0, but fell to 29th-ranked Bates, 5-4. Sophomore Matt McErlean (Hudson, OH/Hudson) remained perfect on the season as he went 4-0 last week and now has a record of 9-0, including 8-0 at No. 2 singles. KENYON snapped a two-match losing streak when it defeated 29th-ranked Bates, 7-2, last week. Junior Jeremy Polster (Shaker Hts., OH/Shaker Hts.) posted victories at second singles and third doubles. OBERLIN had its spring break opening match cancelled due to rain last week. WOOSTER split a pair of matches last week as it defeated Heidelberg and fell to Wittenberg, both by 8-1 scores. Senior Elissa Lauber (Dover, OH/Dover) posted three victories as she went 2-0 at No. 1 singles and picked up a win at No. 1 doubles against Heidelberg. The two victories in singles play were her first two wins of the season. Men’s Field – Athlete of the Week David Burke, Ohio Wesleyan. Ohio Wesleyan senior David Burke (Hudson, OH/Hudson) won the triple jump ( 13.78 meters/45 feet, 2.5 inches) and was second in the long jump (6.61m/21-8.25) at the Cedarville Invitational on March 27. Oberlin senior Clara Shaw (Roseville, MN/Roseville) won the 1500 meters (4:47.67) and 5,000 meters (18:20.88) at the Wooster Invitational on March 27. EARLHAM competed at the Hanover Invitational. The women’s team was seventh as junior Ramona Hemmings (Cleveland, OH/Cleveland Hts.) and sophomore Liz Ross (Davie, FL/Pine Crest) won the triple jump (34-4.25) and and high jump (5-0.75), respectively. Hemmings was also second in the long jump. KENYON’S men placed seventh, while the women were ninth at the Wooster Invitational. Sophomore Robert Wolf (Brunswick, OH/St. Ignatius) paced the Lords by placing third in the 400 meters (51.87), and as part of the fourth-place 4x100 (45.12) and eighth-place 4x400 (3:44.16) relays. At the Wooster Invitational, OBERLIN was third in the women’s team standings and fourth in the men’s. Senior Clara Shaw (Roseville, MN/Roseville) won the 1,500 meters in provisional qualifying time (4:47.67) and crossed first in the 5,000 meters (18:20.88). Leading the Yeomen was senior Seth Wimberly (Covington, GA/Eastside), who won the 200 meters in 22.62 seconds. Sophomore Shawn Chrapczynski (Lorain, OH/Amherst Steele) was second in both the 100- (11.43) and 200-meter (22.67) races. Senior Kyle Faris (Olmsted Falls, OH/Olmsted Falls) won a pair of events to lead the OHIO WESLEYAN men to a third-of-15 team finish at the Cedarville Collegiate Open. He took the shot put with a throw of 51 feet, 0.75 inches, and topped the field in the discus with a toss of 157 feet, 5 inches. Faris met the NCAA provisional qualifying standard in the discus. Senior David Burke (Hudson, OH/Hudson) and sophomore Kale Kooher (Covington, OH/Newton) won the triple jump (45-2.5) and steeplechase (9:38.46), respectively. The Battling Bishop women wound up sixth of 12 teams. Senior Sharon Rymut (Broadview Hts., OH/Brecksville-Broadview Hts.) won the discus (123 feet, 4 inches), and set a school record in the hammer (146-4). She placed third in the event and bested her own school record of 144-3, set last week. WITTENBERG’S men finished 12th of 15, and the women were fourth of 12, both at the Cedarville Invitational. Sophomore Anna Henry (Chagrin Falls, Ohio/Kenston) led the Tiger women with a first-place finish in the 10,000-meter run. The men were paced by a third-place finish in the pole vault by freshman David Kolakowski (Rocky River, Ohio/Rocky River). At its own Wooster Invitational, WOOSTER finished third of nine teams in the men’s standings and fourth of nine in the women’s. Senior Bryan Albani (Warren, OH/Howland) was second in the men’s 400 hurdles (59.08) and third in the 110-meter hurdles (15.56). Through the first two weekends of conference play, Oberlin (4-0, 6-3) and Wabash (5-1, 9-11) lead the East and West divisions, respectively. The Yeomen finish their spring break trip to start the week, then return home to host Kenyon (1-3, 4-9) for a conference series on Saturday and Sunday. OBERLIN went 2-2 last week, including a 2-1 record to start its spring break trip. Junior Max Phinney (Oberlin, OH/Oberlin) went 5-for-5 in a 3-2 win over Marian. Junior relief pitcher Phil Brua (Avon, OH/Avon) appeared in three games and picked up a win and a save. He allowed just one hit in 6.2 innings while striking out eight. 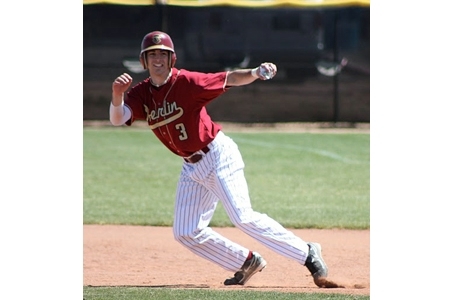 Mesa, Ariz. – The Oberlin College baseball team continued to stay hot as it swept a doubleheader from Hamline University this afternoon at Gene Autry Field in Mesa, Arizona. The Yeomen took the lid-lifter 7-5 in eight innings and scored three runs in the seventh in the nightcap to win 6-5. Oberlin, which is now 8-3 overall and 4-1 on the trip to the left coast, trailed late in game one, but junior Ben Kauder came through with a two-out run-producing hit to tie the game at five in the bottom of the sixth. Kauder also factored into the extra-inning heroics after reaching on an error and stealing second, he scored the go-ahead run on a base-knock by Max Phinney. Phinney, a local Oberlin native, would add an insurance tally as he was driven in by rookie Matt Fish. Sophomore Jason James went 3-for-4 in the game, while Fish and Ben Puterbaugh checked in at 2-for-4. Junior southpaw Grady Campion got the start on the bump and worked 5.1 innings, allowing just three earned runs along the way. However, it was juniorPhil Brua who came out of the pen to earn his first of two wins on the day. In the nightcap it appeared as if the Yeomen were going to settle for their second straight split, but this young upstart team had other ideas. Again it was Kauder who came through in the clutch with a bases-loaded two-RBI single to give the Yeomen the walk-off win. The hit was one of three he had in the game. Trailing 5-2 going into the home-half of the seventh, Fish started the inning with a hit and sophomore Brad Hantler later followed with a bunt single. Puterbaugh, who went 3-for-4 in the game, followed with an RBI single andBrandon Cantrill took one for the team to load the bases and setup the game-winning theatrics. Junior Ryan Mouch made his first-career start on the mound and pitched very well. The Toledo, Ohio, native worked 4.1 innings allowing three runs (two earned) before giving way to Brua who vultured his third win in just two days. Fish and Phinney each went 2-for-3 in the game. Oberlin plays a single nine-inning game tomorrow against Thomas College. First pitch is set for 12 p.m. EST. BEREA - Baldwin-Wallace College junior Katy Marshall <(Medina/ Senior) has been named as the Ohio Athletic Conference Women's Tennis Player of the Week for her performance in two Yellow Jacket victories this weekend, the league office announced today. Marshall was undefeated as B-W stretched its current win streak to three matches with victories versus Walsh University and OAC-rival Capital University. Marshall posted a 2-0 singles record while competing at the No. 6 position. In doubles play, she teamed with senior Andrea Essig (Conneaut/ Ashtabula Edgewood) for a 2-0 mark at No. 3. Versus Capital, Marshall did not lose a set in either singles or doubles competition. For the season, Marshall is tied for the team-lead with 10 singles wins (10-6 overall) and has combined with Essig for a team-best eight doubles victories (8-9 overall). The Yellow Jackets, 6-7 overall and 2-0 in the Ohio Athletic Conference, are idle until a non-league match versus Malone Universityon Tuesday, April 6 at the "Pop" Collins Courts in Berea. Judd Lutz is a two-time All-American in the discus. (AUSTINTOWN, OH)--Mount Union senior Judd Lutz (Tiffin/Tiffin Columbian) was namedOhio Athletic Conference Men's Field Athlete of the Week, the league announced today. Lutz won the discus and shot put at the Bill Horne Invitational in Wheeling, West Virginia. His mark of 170-3 in the discus was the second-best throw in the nation this season and along with a throw of 52-8.75 qualified him in both events for the NCAA Division III Trackand Field Championships which will be held May 27-29 at Baldwin-Wallace College in Berea, Ohio. Mount Union will compete at the OAC Gold Meet this Saturday, April 2 in Marietta. The Viking Report. . .
Softball Highlights Busy Week. . . The spring athletic schedule continues in high gear this week as five of the six spring sports will compete in a total of 14 events with all but five of them coming on the road. Softball, which has opened the year by going 19-7, will be at home for the first time this week when the Vikings open an 11-game home stand with five contests. CSU will host Buffalo for a pair of games on Wednesday (March 31) at 3:00 p.m. The Vikings then begin Horizon League play with a three-game series against UIC, starting with a 3:00 p.m. doubleheader on Friday (April 2) and a single game on Saturday (April 3) at noon. The baseball team will play a single game on Tuesday (March 30) at 6:00 p.m. at Ohio before heading to Milwaukee to begin its Horizon League schedule with a three-game series vs. the Panthers. CSU will play a single game on Friday (April 2) at 3:00 p.m. and then close the slate with a doubleheader at 12:00 noon on Saturday (April 3). The men's and women's tennis teams will play similar schedules this wek. Both teams will be at Valparaiso on Saturday (April 3) with the women playing at 1:00 p.m. followed by the men at 3:00 p.m. Action moves to Chicago on Sunday (April 4) when the women face UIC at 11:00 a.m. followed by the men's match at 3:00 p.m. The men's golf team continues its string of spring tournamanets by competing in the Indiana Invitational in Bloomington, IN. The 54-hole tourney will feature 36 holes on Saturday (April 3) and the final 18-hole round on Sunday (April 4). Liran Gross ended the 2010 NCAA Championship with a 24th place finish in the men's foil, finishing the tournament with a record of 3-20. Gross' three points gave Cleveland State a team finish of 26th, ahead of Cal Tech. "Overall, Liran had a great performance this weekend, he was able to record three victories against top competitors and showcase his talent on a national stage," head coach Andy Tulleners said. "It was great for him to be able to compete against some of the best fencers in the nation, and represent Cleveland State at the national championship." Gross' three victories came on the final day of the competition, recording wins over Alex Simmons of Penn (5-1), Ben Van Son of Haverford (5-3) and Philip Jamesson of N.Y.U. (5-3). Gross led the Vikings this season with a 32-23 record and finished sixth at the Midwest Regional to qualify for the NCAA Championship, his first appearance at the event. After opening the season with 26 straight games away from home, the softball team will finally return to Viking Field when CSU opens an 11-game home stand with five games this week. The week opens with a doubleheader against Buffalo on Wednesday (March 31) at 3:00 p.m. UIC then visits Clevleand for a three-game series over the weekend. The teams will play a Friday (April 2) doubleheader at 3:00 p.m. and close the series with a 12:00 noon meeting on Saturday (April 3). The Vikings carry a 10-game win streak into the week, the second-longest in school history and one win shy of the school record of 11 straight set in 2004. CSU played just one game last week, claiming a 6-1 decision in a rain-shortened five inning game at Robert Morris on Wednesday. Tess Sito hit her team-leading 10th home run to give her the third-highest single season total in school history and three shy of teammate Lia Gordon's single season record. In the first NCAA statistics of the year, which were released on March 23, Sito was third in the nation in batting average (.523), fifth in stolen bases (21), eighth in slugging percentage(.977) and 26th in home runs (10). In addition, senior Amanda Macenko was sixth in victories (15). The Vikings baseball team will begin Horizon League play this weekend, when they travel to Milwaukee to take on the Panthers in a three-game series. The teams will open the series on Friday (April 2) with a 4:00 p.m. game and will have a doubleheader on Saturday (April 3) with the first game beginning at 1:00 p.m. CSU will also travel to Athens, Ohio to take on Ohio University on Tuesday (March 30) in a 6:00 p.m. game. "Last week we had every aspect of our game working, just not all on the same day," head coach Kevin Kocks said. "Going into league play we need to focus on getting the pitching and offense to work together and hopefully get some wins to open the league slate." CSU ended their first homestand at All Pro Freight Stadium with a 1-2 record, posting a 12-1 victory over Case Western Reserve last Saturday (March 27). The Vikings also won at Kent State, 7-5 in 11 innings, to improve to 4-14. The Viking offense was once again led by Kyle Shaffer, who went seven-for-17 at the plate over four games last week, including a grand slam in the victory over CWRU (March 27). Anthony Sambula (3-2) recorded his third win of the season against the Spartans, pitching 6 1/3 innings, giving up one run on just one hit and striking out seven batters. The women's tennis squad hits the road for a pair of Horizon League matches this weekend, beginning with a 1:00 p.m. contest at Valparaiso on Saturday (April 3) before the Vikings head to UIC for an 11:00 a.m. match on Sunday (April 4). CSU improved to 11-10 overall and remained perfect in the league (3-0) by winning all three of its matches last week. "We continue to improve each and every time we take the court and that is due to the hard work each player has continued to put in during practice," head coach Brian Etzkin said. "This is a big weekend for us with our first two league matches on the road and we have to go play our style of tennis." The Vikings ran their win streak to four straight with a 6-1 win over Green Bay on Saturday (March 27) followed by victories over Milwaukee (6-1) and Case Western (7-0) on Sunday, March 28. Senior Charlotte Gibbons and sophomore Catrine Bjerrehus continued their stellar play at No. 1 doubles, winning all three of their matches over the weekend to extend their win streak to 10 straight. Bjerrehus also won all three of her matches at No. 1 singles, while Maria Lazaris (No. 2), Gibbons (No. 3) and Nicole Janek (No. 4) also won all three of their singles contests. The Cleveland State men's tennis team (11-6, 2-0 HL) continues its Horizon League schedule with two road matches this weekend, beginning with a 3:00 p.m. contest at Valparaiso on Saturday, April 3. The Vikings then head to UIC for a 3:00 p.m. match on Sunday, April 4. "We are very focused right now as a team and have been winning some key points to help us in matches," head coach Brian Etzkin said. "With each match we play, our confidence continues to grow and that will only help us as we come down the stretch and get ready for the league tournament." CSU began play in the Horizon League with a pair of victories last weekend, knocking off Youngstown State (7-0) on Friday, March 26 and Green Bay (5-2) on Saturday (March 27). The Vikings then dropped a 4-0 decision at No. 3 Ohio State on Sunday, March 28. CSU played the entire weekend without three-time all-league performer Ryan Hamning who was out with an injury, forcing a number of players to move up a spot in the lineup. Phil Orno (No. 1), Yannick Goossens (No. 2) and John Haley (No. 5) all won two matches in singles play with Orno continuing to lead the team with 23 wins. Haley and Rob Fox moved up to the No. 1 doubles position to win two matches over the weekend, improving to 4-1 in the top spot this season. The men's golf team is back in action on Saturday and Sunday (April 3-4) when Cleveland State competes in the 54 hole adidas Indiana Invitational at the par-71, 6,813-yard IUChampionship Golf Course. "This is always a very tough tournament with a great field so we'll see how far we have come as a team this spring," head coach Steve Weir said. "We have been battling a lot of injuries this spring, but hopefully we'll get a few guys back this weekend and turn in some good rounds." The Vikings placed 11th of 15 teams at the Ball State Cardinal Classic over the weekend (March 27-28), firing rounds of 313-305-305 at the par-72, 6,859-yard Sultan's Run G.C. CSU was playing with just four players as senior Kyle Cobb, normally the Vikings No. 1 golfer, missed the event due to illness. Sophomore James Boxley turned in his best finish as a Viking, tying for fourth place overall at 220 (75-71-74). His 71 in the second round was a career-low. Junior Kellen Erdman notched a top-20 finish, tying for 19th place with a three-round total of 225 (77-74-74). James Boxley: The men's golf sophomore fired a career-low 71 in the second round of the Ball State Cardinal Invitational en route to tying for fourth place overall. Catrine Bjerrehus & Charlotte Gibbons: The No. 1 doubles team won all three of their matches over the weekend, running their win streak to 10 straight.